Deep earth tones in the stone are highlighted by a deep shade carved with a double band motif. 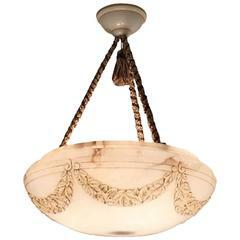 A dramatic black vein flashes across this elegant bowl. 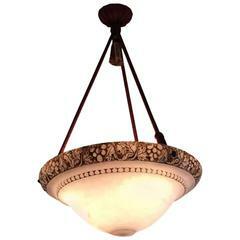 Original hardware and canopy are of cast brass. 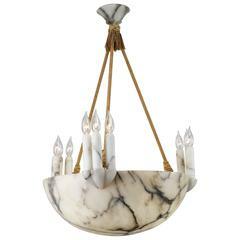 Large one-light alabaster pendant with metal frame and brass frame, circa 1925. Socket: 1 x E 27 for standard screw bulbs. Excellent vintage condition. French Art Deco, (circa 1925) etched glass 16 sided pendant bowl shaped chandelier with geometric sunburst and star design suspended by three chains (signed Muller Freres). 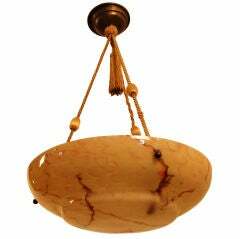 A large alabaster pendant that hangs from woven roping with a round, white ceramic ceiling mount. Ivy leaf swag around the edge is highlighted in a brown staining.